For me, the most exciting aspect of last night’s stunning election victory by the One Bermuda Alliance was not the closeness of the vote but the fact that the Bermudian electorate – and specifically black Bermudians – had the courage to vote for change. It was a watershed moment in Bermuda’s democratic development, as significant as the Progressive Labour Party’s historic sweep to power in 1998 after 30 years of United Bermuda Party rule. In the same way that 1998 was overdue and had to happen, the same goes for 2012. I have always held the opinion that Bermuda would only become politically mature when black Bermudians, as the majority of voters, had the courage to not only elect a predominantly black PLP Government but also to vote them out. The realisation that they truly do have the power to hold Governments of any persuasion accountable is a significant shift. This was an election that Bermudians of all races took very seriously and in which they voted on the issues, and less on emotion and historical allegiance. In future, the OBA and the PLP will underestimate Bermuda’s voters at their peril. The OBA victory was as decisive as it was unexpected. Most pundits – myself included – felt it would be a close election but that as a new party, the OBA could not expect to win power in its first campaign. I had predicted a 19-17 PLP victory but from the moment Glenn Smith not only beat Premier Paula Cox in Devonshire North West but crushed her by almost 100 votes, it was clear change was in the air. In fact, by the time it was all over, the OBA were just 22 votes and a few spoiled ballots short of a 22-14 win, such were the narrow margins of PLP victory in Devonshire North Central, Pembroke Central and Sandys North. BermyArtist.com is a relatively new Bermuda website well worth checking out. Sponsored by The Department of Community and Cultural Affairs and developed by Maven Concepts, BermyArtist is basically a Pinterest-style portfolio for Bermudian or Bermuda-based artists and creative commercial talent, ranging from painting and illustration to poetry, graphic design and jewelry. Artists can post samples of their work for viewing or for sale and you can browse by genre, artist or skill. As it develops it should be a great place to discover Bermudian art and new talent as well as a useful collaboration network. If you’re looking to commission anything from a sculpture or music to a logo or an annual report, this would be a good place to start. I don’t pretend for a moment to be an economist but you certainly don’t need to be one to appreciate that Bermuda’s economy is in bad shape. Whether you blame the global recession or the Government, it’s getting worse and shows no signs of recovery into 2013. According to Bob Stewart, writing in today’s Bermuda Sun, the Island could well be heading towards bankruptcy. Could we really become another Greece? Mr. Stewart, who used to run the Shell Company in Bermuda and knows a lot more about economics than you or I, says that the failing economy and massive debt means Government simply won’t be able to pay for things like seniors’ healthcare and Government pensions. With life expectancy increasing, medical insurance and treatment costs going through the roof, the working population decreasing, and wages fast losing pace with inflation, the math doesn’t add up. It’s simply unsustainable. Writes Stewart: “There are two major government obligations for which adequate money has not been set aside. These are medical insurance (mainly Future Care), and government pension plans of which there are two major schemes. The first is the Social Security Fund, and the second is the Public Service Superannuation Fund. To meet their obligations, without calling on future tax revenue both of these funds should be funded at around the 100 per cent level. Both are massively underfunded – around 35 per cent for each. Young Citizen Award recipients with Government Minister Glenn Blakeney. Photo by Bernews. 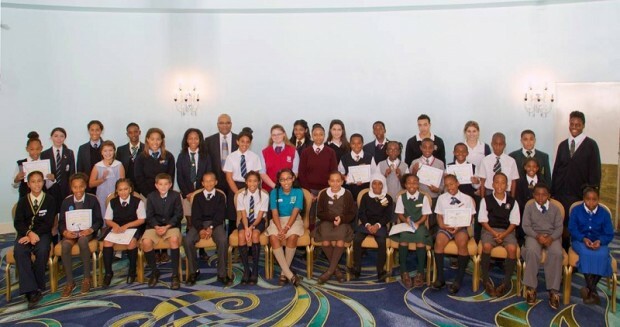 If you follow me on Facebook, you’ll know that my 10-year-old son Toby was honoured this week as one of 37 students awarded Young Citizen Awards by the Bermuda Government’s Child & Family Services department to mark the Universal Day of the Child. This was something of a surprise to us, as well as Toby, as we were not aware of the awards, which have been given for the past eight years to primary, middle and high school children who demonstrate “a kind heart and a caring personality”. Nominations are made by teachers based on their day-to-day observations without the kids being aware of it. Anyway, we received an invitation for Toby and two family members to attend a splendid lunch at the Fairmont Hamilton Princess yesterday with Government ministers, TV – the whole nine yards. As proud as I was of Toby’s nomination, I admit part of me did think this was all a bit over the top for what seemed to be something of a “touchy-feely” award. But as the citations for each child were read out, I soon changed my mind. One child after another was recognised for their compassion or courage – standing up to bullying, not bearing grudges, making time to help out a new class member or one with disabilities, sharing their supplies or snacks, making sure fellow classmates didn’t feel left out, and so on. Some kids were exceptional. You may already have heard of 9-year-old Victor Scott student Malaikah Abdul-Jabbar, who has already written two books, including Stop The Shooting about the violence in her community. The election is less than a month away but as yet, none of our local candidates have knocked on my door. Maybe they’ve done their homework and realised there is no point in canvassing someone who has lived on the Island for 30 years, owns a local business, is the father of a Bermudian child and pays taxes like everyone else but is still not permitted to vote in a democratic election. It’s a pity they haven’t stopped by because I’d really like to hear what they think about the continued and unnecessary discrimination against long-term Residents and what their Government might do about it. Don’t get me wrong, I appreciate the few benefits that a Permanent Residency Certificate (PRC) gives me – for example, I can come and go as I please without needing a work or re-entry permit (albeit at the discretion of the Government) – but it falls woefully short of what most normal democracies would offer people in my position. Without the right to vote and the absurd restrictions on buying property (more of which in a moment), PRCs are little more than second class citizens in the place that we and our children call home. In fact, we’re not even classed as full citizens in the same way that Bermudians and Status Bermudians (long-term residents who received citizenship up to the 1980s or obtained it through 10 years of marriage to a Bermudian) are – yet to even qualify for a PRC I had to have been on the Island before August 1, 1989, lived here for 20 years, and be over 40 years of age. Between us, my wife (also a PRC) and I have 56 years residency in Bermuda, so our commitment to the Island is not in doubt – in fact I have lived here longer than I lived in my native UK – so why should we not have a democratic say in affairs that affect the lives of our family?